The Brooklyn Navy Yard was originally built in 1801. 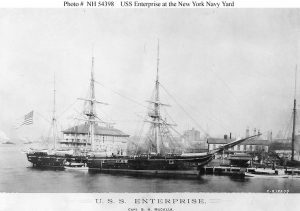 The shipyard played a critical role in the United States’ national security and U.S. Navy building plans for more than 150 years until it was closed in 1966. Today, the Brooklyn Yard has become even more famous for the adaptive reuse of a historic site as a modern industrial park employing thousands of New Yorkers. It wasn’t until Veterans Day, 2011; however, that the Brooklyn Navy Yard Museum was opened on the 300+ acre shipyard campus to help tell the story of the vital role the Yard played in America’s shipbuilding and wartime successes over the 19th and 20th Centuries. The relatively new museum is located in the newly restored 1857 house of a former Marine Commandant attached to a three-story visitors center. 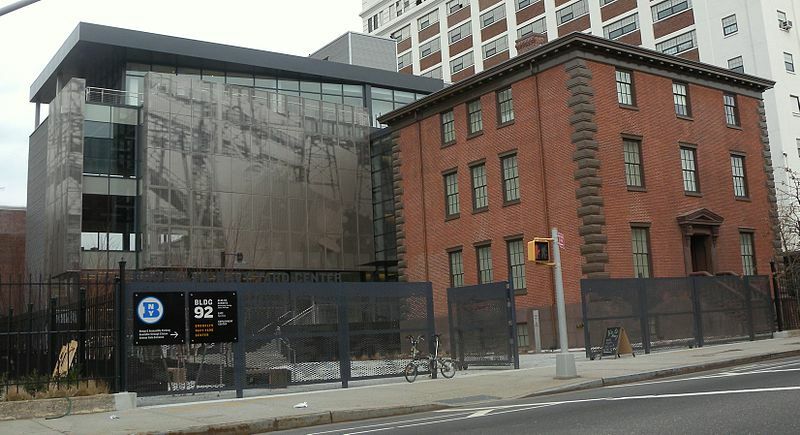 6 Why Should You Visit the Brooklyn Navy Yard Visitors Center? 7 Where Do You Park When Visiting the Brooklyn Navy Yard Museum? 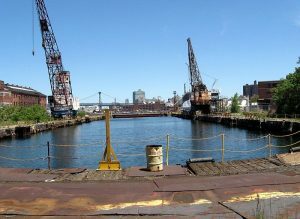 Looking north in en:Brooklyn Navy Yard at a drydock on a sunny morning. Shipyard (NYNSY) during its time as an active yard. The facility is located approximately 1.7 miles northeast of Battery on the East River in Wallabout Basin across from Corlear’s Hook in Manhattan. The shipyard is bounded by Flushing, Navy Street, and Kent avenues. At the height of production, the shipyard spread over 200 acres. Backing up a bit, the Brooklyn Navy Yard has its origins from just after the American Revolution when the Federal government purchased the old docks and 40 acres of land for $40,000 in 1801 to later make the facilities into an active navy shipyard in 1806. The oldest structure in the complex was built in 1807 and served as the Commandant’s house (designed by Charles Bulfinch who also designed the U.S. Capitol building in Washington D.C.). From 1830-1838, the Naval Hospital was built. It would later be rebuilt from 1841-1843 and stay in service until the mid-1970s. By the time the American Civil War started, the shipyard had expanded to see more than 6,000 men report for work each day. The Brooklyn Navy Yard is also famous for being the building yard for the USS Maine. 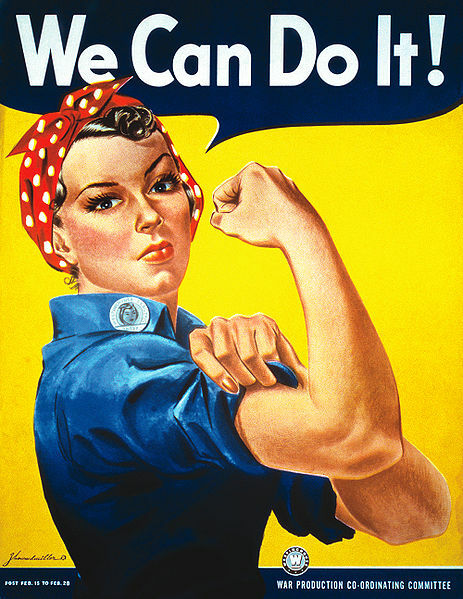 "We Can Do It!" 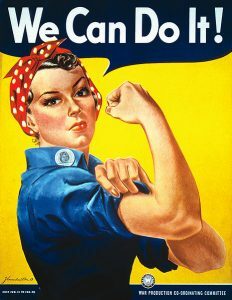 poster for Westinghouse, closely associated with Rosie the Riveter, although not a depiction of the cultural icon itself. Pictured Geraldine Doyle (1924-2010), at age 17. Source From scan of copy belonging to the National Museum of American History, Smithsonian Institution, retrieved from the website of the Virginia Historical Society. Before WW2 kicked off, the Brooklyn Navy Yard already consisted of more than five miles of paved streets and four drydocks that varied in length from 326 to 700 feet long. 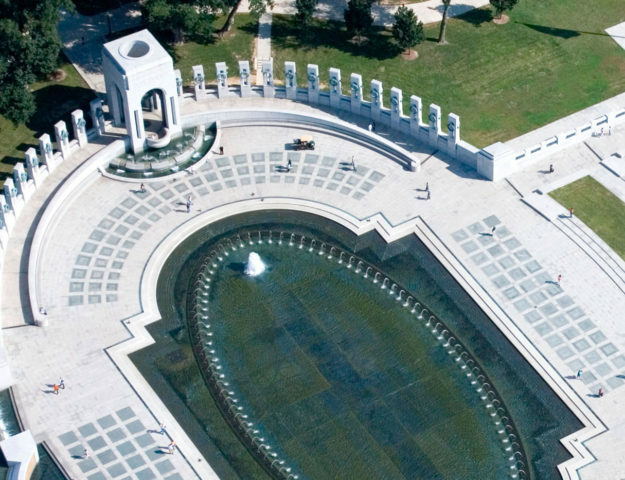 The Yard also had six pontons and floats for salvage work, two steel shipways, a power plant, Marine barracks, a railroad spur, a large radio station, machine shops, foundries, and warehouses. In 1937, the keel for the USS North Carolina battleship was laid. By 1938, the Brooklyn Yard would employ over 10,000 men which included more than 3,000 Works Progress Administration (WPA) employees. 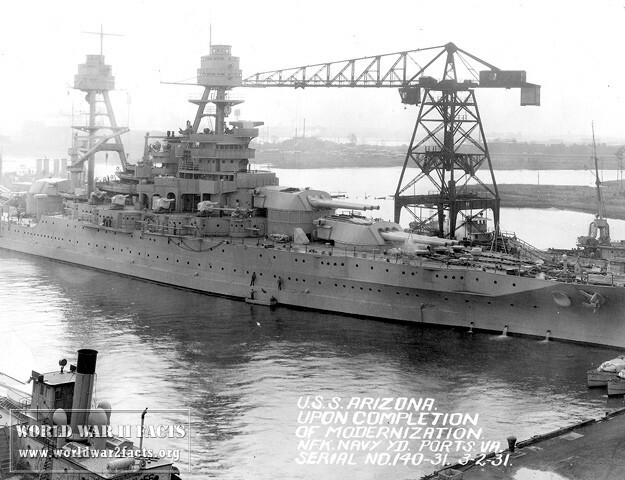 The shipyard would finish construction on the Iowa in 1942 followed by the battleship Missouri that would ultimately host the Surrender of the Empire of Japan on September 2nd, 1945. Once the U.S. navy received PT 109 from Elco on July 10th, 1942, the ship was then delivered to the Brooklyn Navy Yard to be fitted out. PT 109 was sunk in August 1943 and would later become famous when the former Commanding Officer, LTJG John F. Kennedy would enter politics and become President of the United States. At the peak of World War 2, the Brooklyn Navy Yard would employ approximately 70,000 personnel who would work three shifts a day throughout the war. It seemed like forever before the Brooklyn Navy Yard Visitors Center and Museum opened on Veterans Day in 2011. The attraction is highly popular for both Brooklyn residents and visitors due to offering a unique insight into the major role the Yard has played in the past history of the United States and current-life in Brooklyn. The Brooklyn Navy Yard Visitors Center is housed in the 1857 Marine Commandant’s Residence. Renovated for its new role as well as including a modern extension to the property, the $25 million Center includes an event space, high-tech museum, and helps document the legacy of the shipyard. The Brooklyn Navy Yard Museum Visitors Center also features a number of showcases of the Yard’s history from 1801 (founded) through 1966 (closing of the yard). For those interested in the modern industries now located in the Brooklyn Yard, the Visitors Center also includes displays educating visitors about the new green, micro-industries that are housed throughout the Navy Yard buildings. Finally, for the romantics out there, the Navy Yard also features a number of romantic, industrial views of both the East River and Manhattan that are unique to the area. Looking northeast across Flushing Avenue at Building 92 and brick neighbor on a cloudy afternoon. 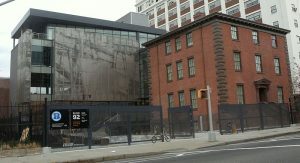 Similar to the Brooklyn Historical Society, the Brooklyn Navy Yard includes a number of oral histories and video interviews from past workers in the shipyard to augment the presentation of the shipyard’s history. The displays also include exhibits that feature the 5,000 women that volunteered in the shipyard during World War 2 to help work in the numerous manual jobs normally held by men exemplified by the now famous, Rosie the Riveter. The museum also includes documentation of the African American shipyard workers to include a short film interviewing a black nurse who describes his memories of working in the then-segregated military hospital during WW2. "explore the Yard’s rich and illustrious history serving both national and local communities, its evolution to become a national model for sustainable industrial parks and its continuing role as a vital economic, manufacturing and cultural hub of Brooklyn." 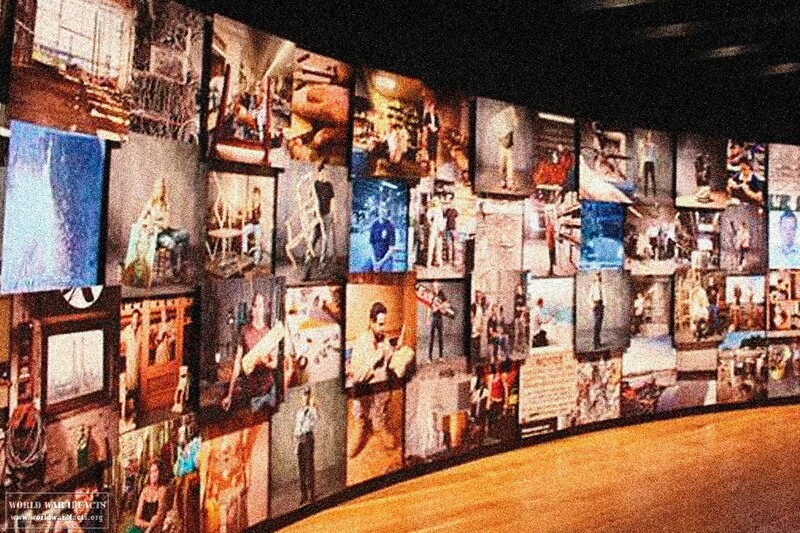 Why Should You Visit the Brooklyn Navy Yard Visitors Center? 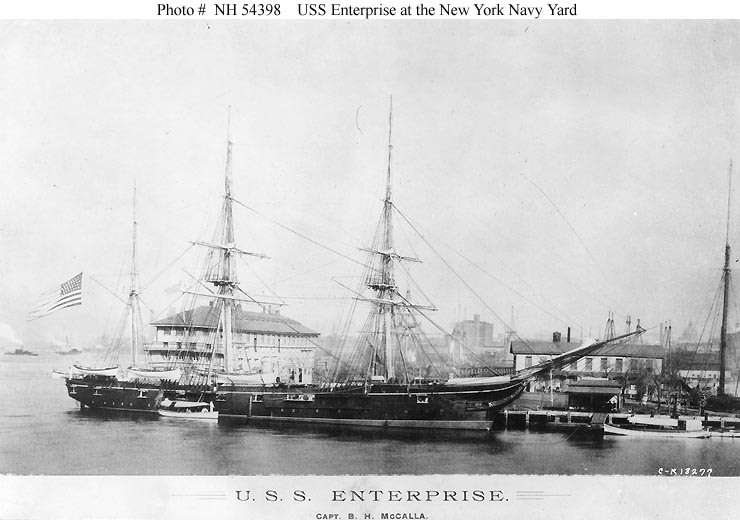 USS Enterprise at the New York Navy Yard, circa spring 1890, when she was commanded by Commander Bowman H. McCalla. The receiving ship Vermont is in the background. Photographed by E.H. Hart, New York City. land marked buildings. There are a number of rare views of the New York waterways and historic structures around the area. Additionally, as a modern example of adaptive reuse and NYC urban history, the site brings in both local visitors as well as tourists from around the world! Where Do You Park When Visiting the Brooklyn Navy Yard Museum? Most experienced tour guides (or locals), will recommend that if you are considering a trip to the Brooklyn Navy Yard that you find an alternative method to travel to the site which is not via a privately owned automobile. There is on-street parking in the area, but depending on the day of the week and time of day, you may be out of luck. There are parking lots just over a mile from the shipyard if you are the walking type, and there is also a weekend Brooklyn Navy Yard shuttle bus that runs from downtown Brooklyn as another alternative to taking a cab or leveraging other public transportation options. Finally, there is no on-site parking at the Brooklyn Navy Yard for visitors! The on-street parking that can sometimes be available can be found on Flushing Avenue near the entrance to the Yard in addition to the side streets and avenues off of Flushing. Make sure you don’t park illegally, or you will get a ticket! For those who want to park “On the Cheap,” there is non-metered parking available on Park Avenue between Navy Street and Kent Avenue. If you have handicap car plates, the Visitors Center recommends you contact them for information on where to park your car. Naval Hospital Brooklyn Navy Yard, last accessed April 24th, 2013. 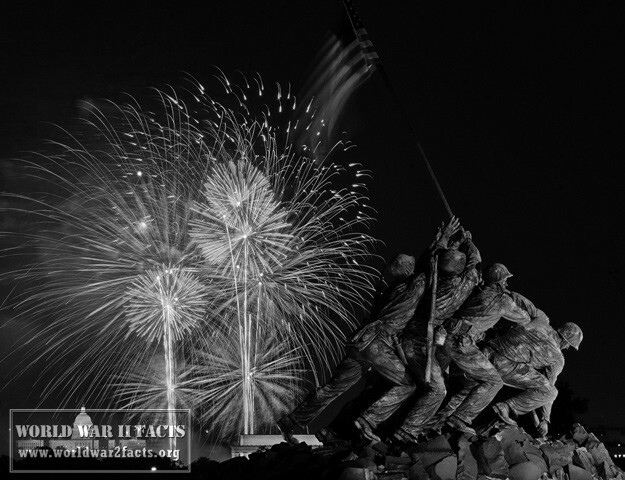 “Museum shows why Navy Yard more than just warships, Associated Press, November 26, 2011". Last accessed April 24th, 2013. 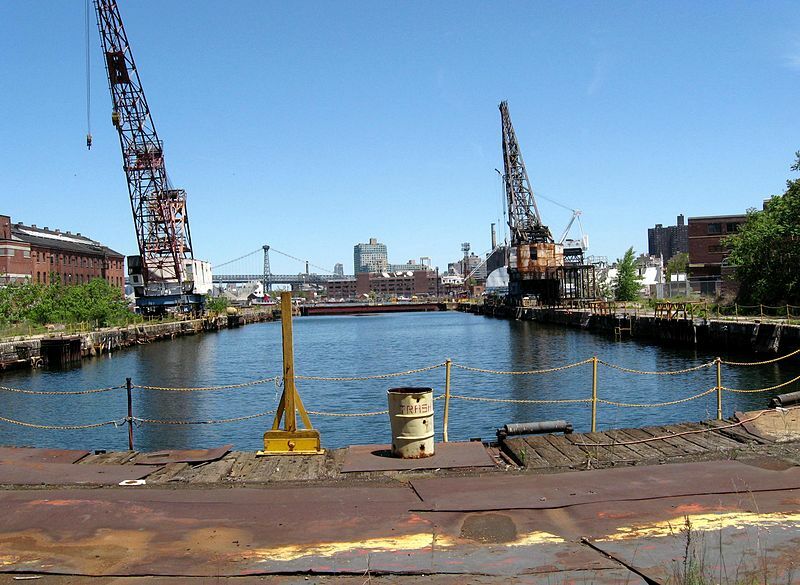 "The Struggle to Preserve the Brooklyn Navy Yard, The New York Times, May 14, 2010". 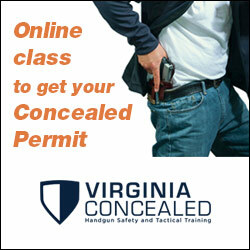 Last accessed April 24th, 2013.